Of all the annual flowering plants you can grow in your cutting garden (or even the back of your veggie patch), none are more productive than cosmos. They truly are a cut-and-come-again flower: the more you harvest them, the more they bloom. A single planting will produce buckets and buckets of airy, delicate, daisy-like blossoms for many months. You can arrange them on their own or weave them into mixed bouquets. Cosmos are incredibly easy to grow, making them perfect for beginning gardeners. Seeds can be started indoors to get a jumpstart on the season or sown directly into garden beds once the weather warms. Either way, cosmos will bloom in just under three months from the date you sow them. To start indoors, sow seeds 4 to 5 weeks before the last spring frost, and then plant seedlings into the garden once all danger of frost has passed. Be careful not to sow seed too early, because seedlings will quickly outgrow their pots before the weather has warmed enough to put them out into the garden. Alternately, you can sprinkle seeds in your garden once the danger of all frost has passed. In about a week, you’ll see seedlings sprout up from the soil. Keep the young plants protected from slugs and snails as they are getting established since new growth is quite tender. Plants get very bushy and prefer a little extra room to spread out, so space plants 12 to 18 inches apart. Once in the ground, cosmos will grow rapidly, so be sure to stake them early, while they are still young. Cosmos also benefit from a technique called pinching, as this will encourage the already highly productive plants to branch even more vigorously. Here’s how it’s done: When plants are young, between 8 to 12 inches tall, take sharp pruners and snip the top 3 to 4 inches off of the plant, just above a set of leaves. This signals the plant to send up multiple stems from below where the cut was made, resulting in more abundant flower production as well as longer stem length. I typically do two sowings of cosmos, a month apart, and include some of my favorites listed here. This gives me a wide range of flower types and loads of blooms for cutting from summer into fall. The Double Click series is available as a mix or in single colors. 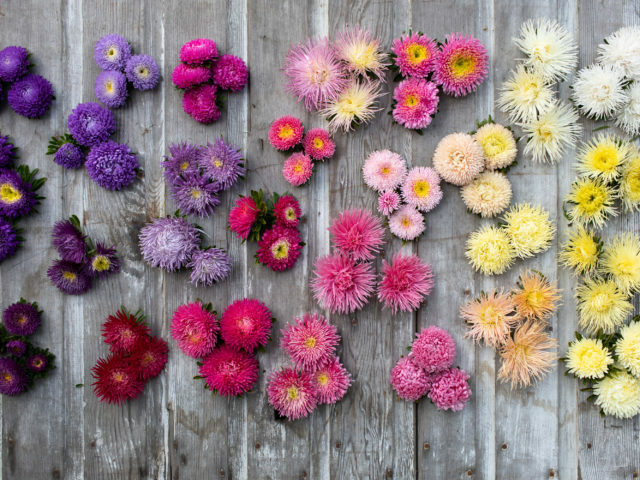 These unique double-flowered variety is loaded with fluffy blooms that look great in bouquets. The Double Click Mix (pictured above) includes snow white, vibrant cranberry, rosy mauve and a lovely soft blush. Individual colors are also available and I am particularly fond of BiColor Rose, Cranberries and Snow Puff. Purity (pictured left) is a cheerful daisy-like bloomer that has perfect, pure white single flowers and produces an abundance of wildflower-like blooms. The large, pure white blooms of Psyche White (pictured right) are a mixture of single and semi double flowers with a central ring of fluffy miniature petals. The ruffled flowers look like snowflakes dancing in the breeze. The pale blush petals of Cupcake Blush are fused together forming a teacup shaped flower. Blooms are as big as the palm of your hand and the edges look like they have been cut with pinking shears. This romantic variety is a mix of single, semi double, streaked and solid flowers. Perfect for wedding work, this variety is a must grow! Cupcake White is a pure white version of its blush sister. 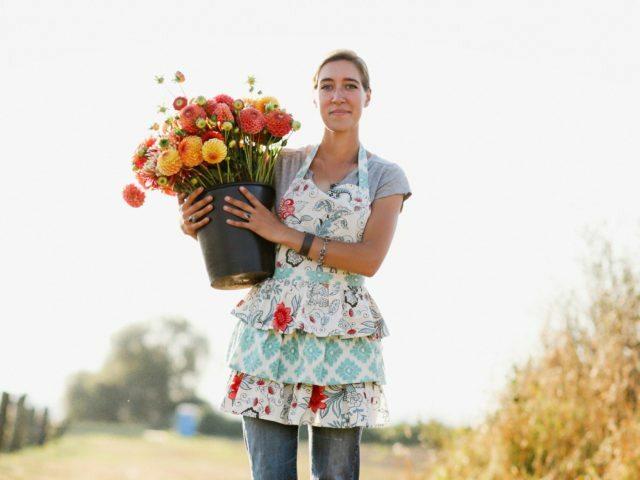 Flowers are as big as the palm of your hand and are extremely versatile for arranging. This uncommon cosmos displays a vibrant range of colors. The large single blooms of Rubenza (pictured left) open with deep ruby petals and then fade into shades of muddy rose and terracotta as they age. There is nothing like it. Velouette (pictured right) has fast become a new favorite on the farm and features deep mahogany flowers with delicate white striping. Tall and dramatic, this variety churns out armloads of long stems that are perfect for bouquets. These fun new novelty cosmos are the most unusual colors and while both are on the shorter side, what they lack in size, they make up for in exquisite coloring. The delicate pale yellow flowers of Xanthos (pictured left) has green undertones. Its unique ruffled flowers have a subtle inner collar and pale throat, and blossoms have a dark yellow eye encircled by tiny fringed petals with pale serrated tips. There is absolutely no cosmos like the beautiful Apricot Lemonade. The unique color reminds us of ‘Distant Drums’ roses – watercolored petals start out a soft apricot with a dusty lavender reverse and fade to a buttery yellow. Variations amongst the blooms include some flowers with a mauve ring at the throat. A bit of separation between the petals conjures a pinwheel with snipped dovetail edges. A must grow for event work. Striking in both the garden and the vase, these fun and eye-catching varieties are a must grow if you’re looking for something different. The palest pink blooms and a dark rosy throat make Daydream (pictured left) an eye-catching addition to the landscape. A sweet treasure for the cutting garden or flower border. This variety has proven to be the most heat tolerant cosmos we’ve grown. 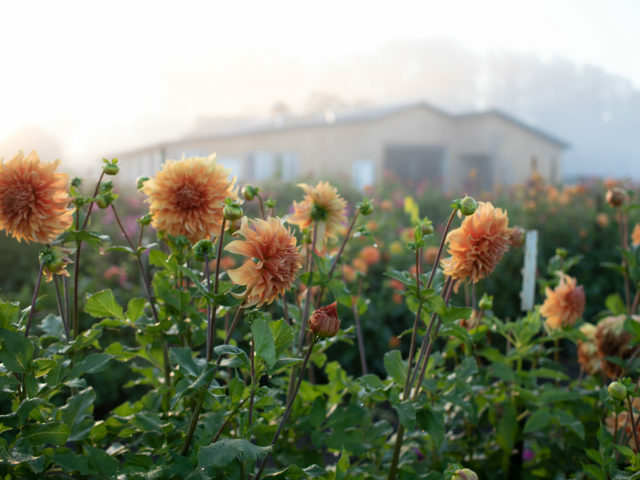 These early to flower gems are a new favorite on the farm. Shades of magenta, purple and raspberry have an iridescent quality and age to an apricot cast. Blooms on Xsenia (pictured right) are more petite than other cosmos varieties, and medium sized, healthy plants carry flowers on strong, upright stems. So many colors give the flowers a chameleon-like quality, and they mix well with a wide range of colors. Seashells Mix (pictured left): This delightful mix is filled with large, showy blooms that have fluted, tubular petals that resemble seashells. Flowers come in a sweet pastel mix of pink, rose, white, carmine and other unique bicolors. 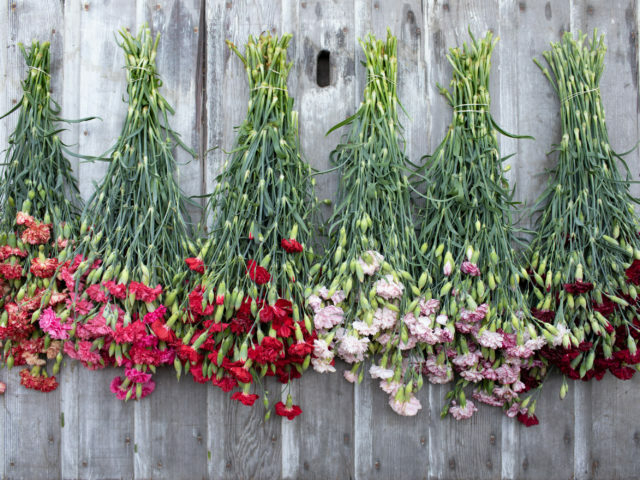 Rosetta (pictured right) is a new variety that’s a must-have for arranging and looks stunning arranged en masse. Blooms have a layer of half double petals that resemble fluffy petticoats. Rosetta is a mix of soft pink, blush and rose, with each petal appearing as if it was hand painted. 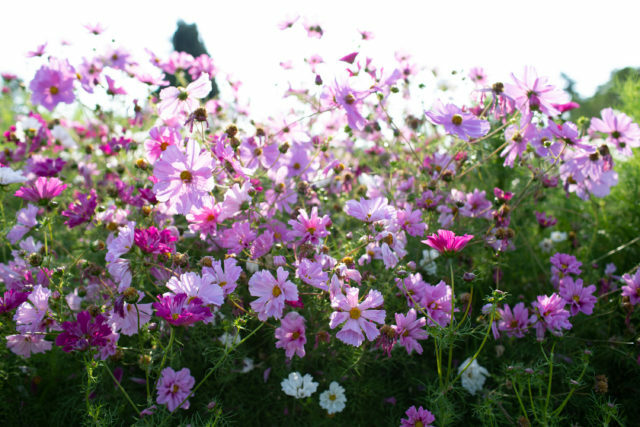 To prolong their flowering time, keep cosmos harvested regularly and deadhead any spent flowers before they set seed. The individual blooms of cosmos don’t last a particularly long time in the vase, about 4 to 6 days, but each stem is loaded with multiple blossoms that open individually over a period of a week. Harvest when the buds are colored but haven’t opened up yet; this will keep insects from pollinating them and help stretch the vase life by a few additional days. For a small investment of time and garden space you will be able to fill your house with these cheerful flowers all summer long. I would love to hear your experience with this wonderful group of plants. Do you grow cosmos or plan to add them to your garden this coming season? If so, what are your favorite varieties? I don’t find it difficult to get at them for cutting flowers because it’s a very narrow row but this year I am also going to try some new varieties and expand it to double width. I don’t usually start to get flowers until August but they flower continually up until the first frost around Halloween and some years are still going into Nov.! It’s great to see end of summer and early fall when so many other flowers are on their way out…I love how heatwave hardy cosmos are and how well they do if I can’t get to watering in the dry years. Some years i’ve only watered once or twice the whole season and they’re so low maintenance, they have managed to put out an abundance of blooms on rain alone ! They love being in just sand but I do mulch heavily every time I cut the lawn with grass clippings since Sand doesn’t hold the water very well, and all they need is a good drink once a week. Thank you for bringing us beautiful new varieties and colours Floret!! if I was lucky enough to have a full sun part of my property I would have a field of cosmos ! They are so lovely the way they move in the breeze and look delicate but are such a hearty low maintenance plant. They definitely don’t last long in the vase and I would love to know what kind of flower food you recommend ? and thank you for the tip on cutting before pollination …cheers! Your pictures get me in trouble every single time! Last year was my first year to seriously grow cosmos. I had planted them previously, but with little luck. They are beautiful blossoms and I love the airy blooms and foliage. This year, I’m playing with Double Click Mix, Purity, and Seashells – all from your store. Love your idea to succession plant. I’ll start about 1/2 my seeds inside and plant out in early May and will plant my seeds outside at the same time. Thank you for what you do. You are inspiration and courage sandwiched between beautiful photos. I can’t wait for the snow to leave! Your post feels like spring! A European seed company lists cosmos and strawflower as hardy annuals which was such a revelation for me. They are always listed as HHA in seed catalogs. Didn’t grow cosmos this last season, but I did attempt to grow strawflowers and they withstood considerable frost and survived to about 29. I live in the Atlanta area and neither of those ever does well for me. Because of the high summer heat and humidity here, hardy annuals bloom April and May and raggedly into June and then they literally die or just look awful and one feels compelled to pull them out. I received a bonus pkt of Cosmos with my bulb order and will likely try one more time. I have often read that cosmos prefer rather poor soil so I followed that advice. I will give them better soil this year and may have different results. Thank you for the Cosmos inspiration! I’m looking forward to trying several of these this summer. Can I add Cosmos to my peony bed? It’s the only place I get enough sun. Will they impact my peonies foliage? Peonies are such a short season it would be nice for the bed to do double duty. I have rabbits visit my yard often. How do I protect cosmos from them? Last year I ordered several varieties of Cosmos from Floret, and Erin’s absolutely right, they are truly the workhorses of a cutting garden! I had bouquets all summer for myself, neighbors, family & friends. Sooooo simple….I bought a small heat mat and seeded them indoors and within 3-5 days, had plants! After growing them up a little they got planted outdoors, I pinched them back a little later, and they were on their way. Deer leave them alone, too. Nothing not to like about Cosmos, give them a go!! Very helpful post, thank you! Sometimes I find it difficult to tell the difference between several similar-looking varieties, so I especially like your descriptions here. Some other varieties I like are ‘Bright Lights’ and ‘Candy Stripe’. I’d love to try ‘Psyche White’, ‘Velouette’, and ‘Apricot Lemonade’, but I had to hold myself back from getting those this year because I am moving and trying to limit what I’m starting from seed inside… sad but next year will be more exciting! Cosmos are supposed to be among the easiest flowers to grow, but I’ve had little luck with them. They always start out fine, but soon the leaves start browning from the bottom up. I live in Atlanta where summers are hot and humid. I’ve tried in a couple of different spots, but the same thing always happens. I’m contemplating waiting until midsummer to plant some – I’ve read they like late summer/early fall conditions. Can Cosmos be planted I the Phoenix, AZ area soon in order to enjoy them before the heat of summer? Are there specific stakes you recommend? Thank you!!! For everyone who didn’t get flowers until august, cosmos are a bit daylength sensitive. If they’re established before day length reaches 14 hrs, you’re fine. If not, they won’t really flower until daylength gets back down to 14. This is important for those of us waaay south who have longer daylengths arriving much sooner in the season :) start seeds indoors 4 weeks before last frost, transplant and you should be fine. I’m in Australia where it’s mid-summer – if I was to sow the seeds now, would they still grow and flower before autumn (fall)? Hi I would love tips on where to cut them for long stems in a vase – this sounds so obvious, but are they still ‘cut and come again’ like you and Sarah Raven describe even if you’re cutting long, branched stems with multiple blooms? Thank you! I grew cosmos from seed last year and they didn’t flower until August. Then they bloomed until frost in November! I didn’t pinch them back, but I will try that this year sand at if they get bushier. They l the only thing you mention that I didn’t thing would be necessary for cosmos is staking. How seriously will your varieties need staking? Can I get away workout? Thanks so much for the info! I just received some cosmos seeds yesterday and I’m excited to see them blooming later this summer. Being new to flower farming game I’ll take all the info I can get so keep it coming!!!! I grew snow puff last year and it was awesome. It was my first time growing cosmos. They were 5 feet tall and tons of beautiful blooms. I’m growing them again this year with the addition of the double click bi-colour rose. I will also try succession planting them. Last year I planted them as a second crop behind a crop of stock. They bloomed till frost but the best blooms for cutting were earlier on. Im just sad, that in my country (Hungary) there is no big seed company or farm who is selling these varieties. Have you checked Sarah Raven? I believe she ships throughout the EU. We also can ship seeds to almost all European Union countries. 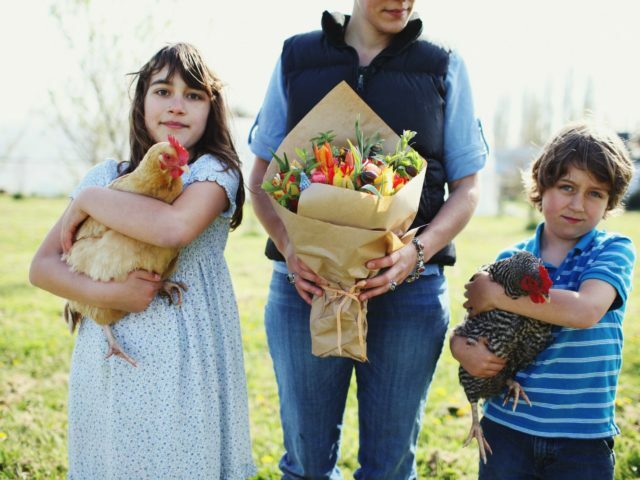 Hopefully you can snag some seeds for your garden this year! Cosmos are my very favorite cut flower because they always produce so many blooms with very little work, plus I love their long, airy, dance-like demeanor in a vase. In the language of flowers, they stand for ‘joy in love and life’ which makes me love be them even more . I grew your rubenza last year and loved it for my event flowers but my very favorite are the white varieties. Someday I think I would simply grow a meadow of white and full my home with them . I did not order my seeds from you early enough to buy the cupcake variety but will hope you get some more in so I can try those. They look marvelous. Thank you for all your research and discovery of unique flower varieties. Keep up all the good work. I love following all of your endeavors and fondly remember back to that magical workshop with you years back. Is it okay to grow Cosmos is a large wooden barrel? That’s really all I have to grow my flowers in. Any tips for growing my flowers in barrels?! I have double click and intend to buy some cupcake blush when they come available! I don’t have a particular green thumb or fingers for that matter, BUT I’m stepping out of my comfort zone and trying these pretty babies this year. Excited to see the outcome! I will post a picture to share the “joy” if I can! I grew cupcake last year. They grew realy big but didn’t flower before august. I suppose there was to much nutrient in the soil. This year I will give IT another try. I have yet to grow cosmos from seed but this is the year! Thank you for the inspiration and the information! I have a crazy Cosmo question! I’m super new to gardening (because up until now I’ve always lived on the second floor of an apartment building) but I’m obsessed with the idea of turning my yard garden into a beautiful self seeding wildflower field. It’s a little tricky finding the right mix for our Southern California zone but I’m working on it. Cosmos are great and such terrific self seeders, but I have the weirdest results when they grow up. I get either one of two versions, tiny skinny little cosmos that give me one or two flowers and then dry up… or on the opposite side of the house I get literal TREES. I pinch off the leaves to get more blooms and they grow to over five feet and up, the stems at the base are easily 1/2 inch in diameter, and sometimes they grow so heavy they tip over. I get a lot of blooms on these! But… they are kind of freakish. Any insights?? I’m sure this has something to do with the soil/water/light. How big are Cosmo’s supposed to grow? If you aren’t doing it already, I’d definitely pinch them. Here’s how it’s done: When plants are young, between 8 to 12 inches tall, take sharp pruners and snip the top 3 to 4 inches off of the plant, just above a set of leaves. This signals the plant to send up multiple stems from below where the cut was made, resulting in more abundant flower production as well as longer stem length. Also, are you staking them? This will help them not fall over. Between pinching and staking, you should have gorgeous plants this year! I started some a few years ago because I remembered how much my Mum loved them. They’ve kept reseeding themselves in the garden and I just love how tall they get and the beautiful feathery foliage. This year I will be starting some of the double click mix to include in market bouquets as I no longer want to strip my household beds of their beauty to keep up with demand. I used to bring flowers to decorate my booth. Now I sell them alongside my veggies and homemade jams, jellies and pickles. Last year was my first time growing cosmos (I grew Cupcake Blush) and the plants were SO HUGE I called them flower bushes 😜 lol! The butterflies and bees loved them! Can’t wait to grow more this year – I’m adding Double Click mix and Rubenza to the garden this year! Thank you for all your recent blog posts and sharing your knowledge with the world! There’s so much good info here! I love cosmos ! I’ve grown seashell in the past-so pretty & so easy. I’ve been quite taken with chocolate cosmos the last few seasons -had a hard time finding them -but I got lucky that an local greenhouse had seedlings last year -they were lovely but I had trouble with them falling over -I had.to put in some support-i think they may not have been getting enough sun -I will try a different location this year I’ve ordered Rosetta & Xsenia from you-they are so beautiful & looking forward to seeing if I can achieve something close to your gorgeous results . 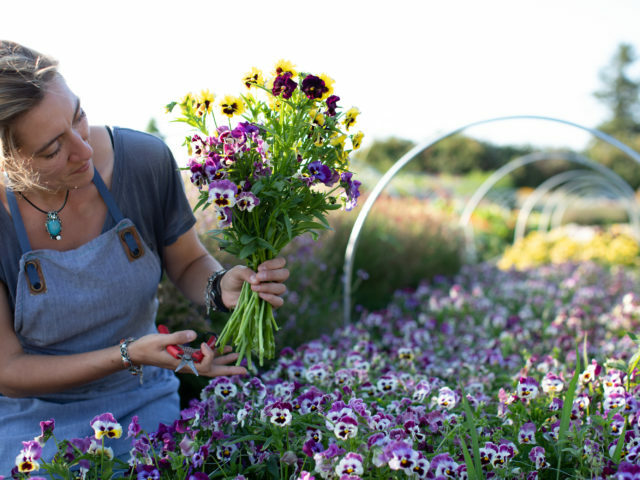 Thanks so much for sharing your experiences, your advice & your passion for flowers.